Scan a foot within 7 seconds from the integrated cloud sourcing. Fast and accurate. Foot scan data is directly available to be used in the online orthotic design software. With a weight of only 11.1kg and its slim dimensions, the Voxelcare 3D laser foot scanner is perfectly suited as a mobile scanning device. The 3D laser foot scanner combines the best of 3D and 2D scanning. The scanner generates a 3D foot shape files including the foot texture. This makes the scanner a perfect device for clinical applications (e.g. diabetic foot) or shop environment. 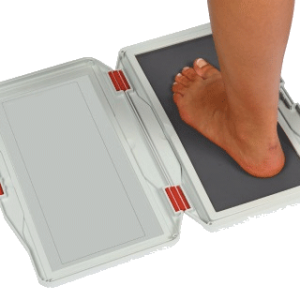 The versatile scanner allows you to capture data directly from the patient‘s foot in full weight, semi-weight or non-weight bearing position. This makes the scanner even suitable for patients who cannot stand upright on the scanner. • Scanning time: less than 25 sec. • Efficient: scans and digitizes your desired object in a simple and efficient way in less than 7 sec.